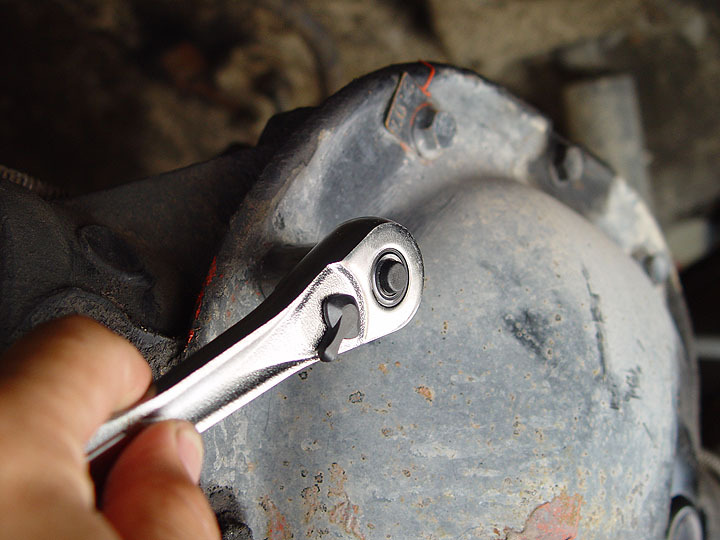 Changing the fluid in your Jeep's differentials is important part of routine maintenance. 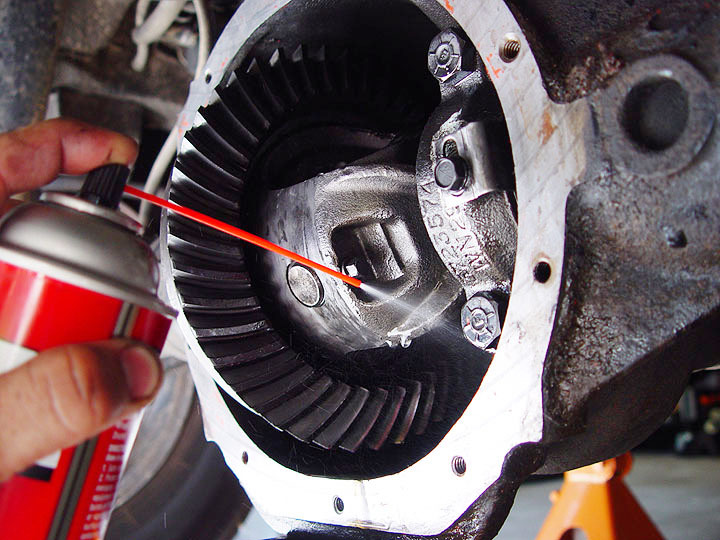 New gear oil will insure your differentials will be properly lubricated but taking the time to pop open the cover will also gives you a chance to inspect the gears within it for any damage or unsual wear. As I like to say, better to catch a potential problem in the garage than having to figure out how to fix it on the trail. Following "Schedule B" in the Jeep owner manual (heavy driving), I change my differential fluids every 12,000 miles. However, It's always a good idea to do this after going through a deep water crossing too. Below is a list of what you will need and instructions on how to perform this service yourself on a Dana 30, Dana 35, Dana 44 or Chrysler 8.25 axle. NOTE: The photos used have been taken over the years from servicing multiple axle differentials on my three Jeeps. However, the proceedure for all are either the same or I have addressed specific issues each may have. 1. Park your Jeep on level ground and chock your front tires. 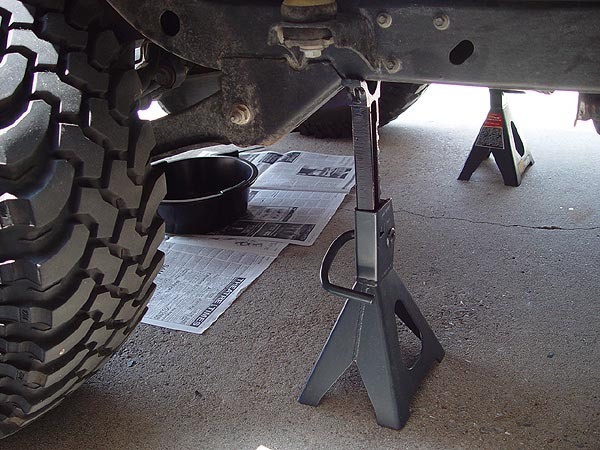 If you're not lifted or are just slightly lifted (2"BB), you will want to jack up your Jeep from the differential, place a jack stand underneath each of the frame rails just in front of your rear tires and then lower everything back down. 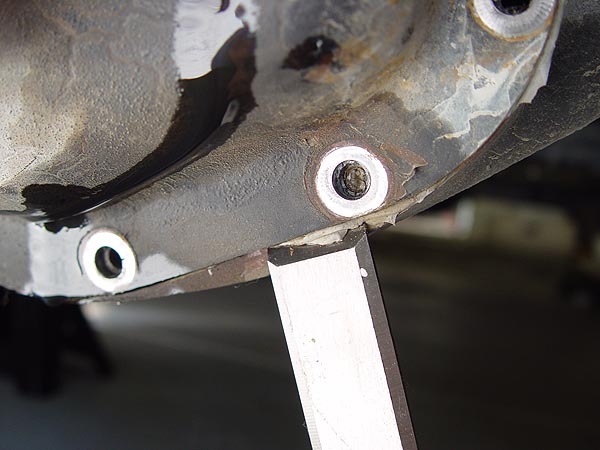 This will cause your axle to droop allowing you easier access to the upper differential cover bolts. 2a. 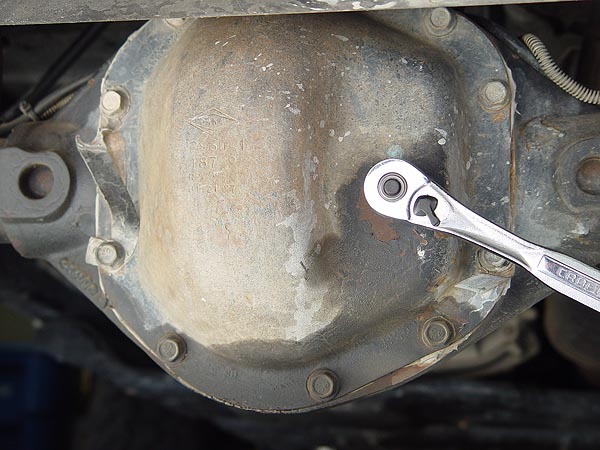 If you are servicing a Dana 30 or Dana 44 differential on your Jeep, place place an oil catch pan underneath the differential and then use the square head of a 3/8" drive ratchet to remove the fill plug on your differential cover. 2b. 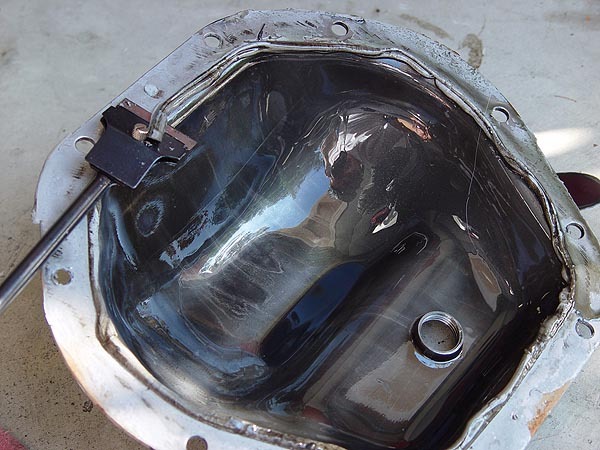 If you are servicing a Dana 35 or Chrysler 8.25 differential on your Jeep, place an oil catch pan underneath the differential and then pry the fill bolt off the cover using a flathead screwdriver. 3. 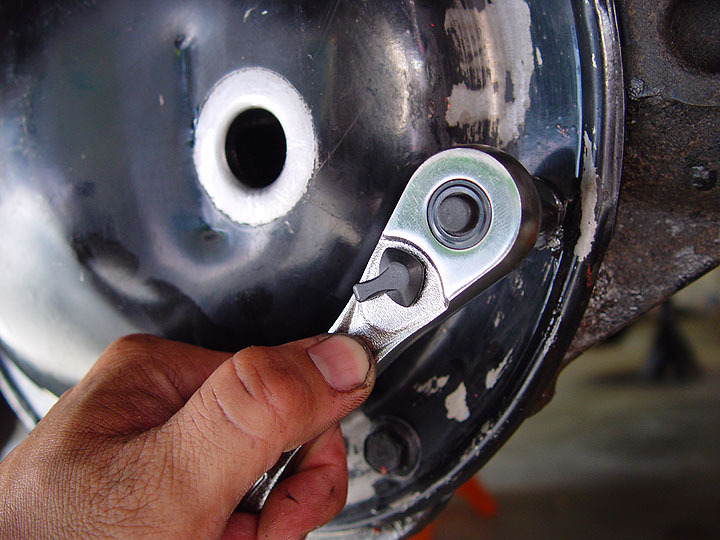 Using a 1/2" socket, remove all but the very top bolt on the differential cover. Leave this last bolt loose. 4a. Give your Jeep's differential cover a couple of good whacks with a deadblow hammer to break it free from the RTV seal still holding it onto your Jeep's axle. 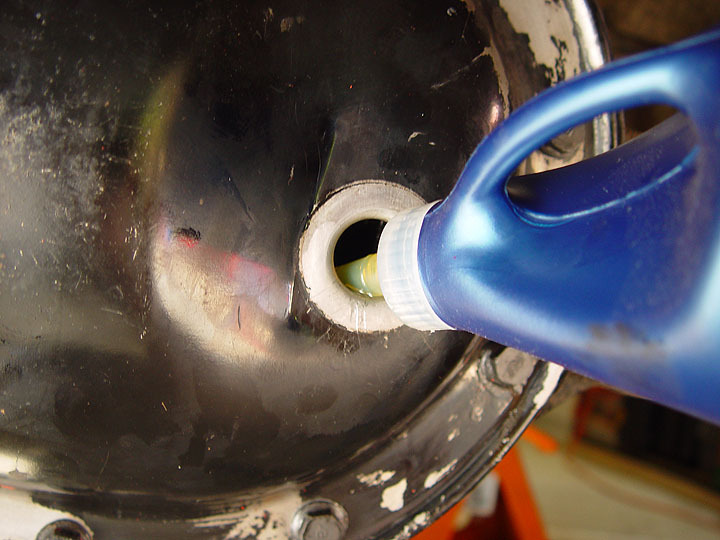 Once it breaks free, the top bolt you left on will keep the cover from falling while the gear oil drains into the oil catch pan. 4b. 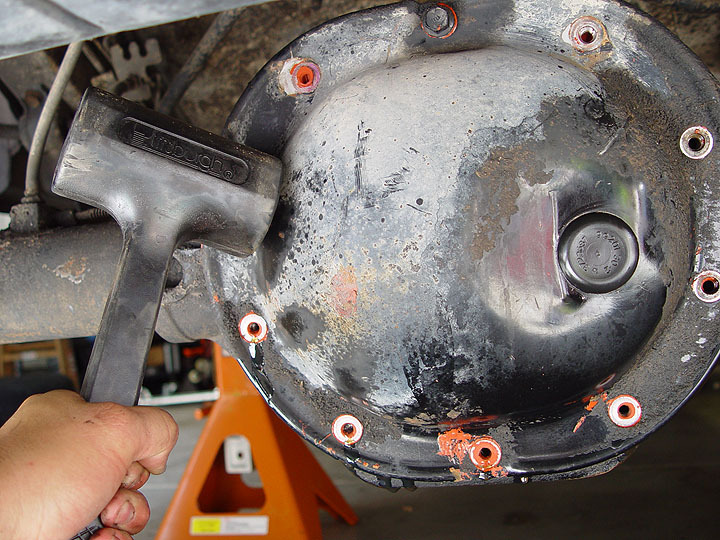 If you are unable to break the differential cover free with a deadblow hammer, another method to free it is to place a flat chisel between the differential and cover and then carefully tap it with a hammer until the cover separates just enough to allow the gear oil inside to drain. 5. Allow the differential gear oil to completely drain into your oil catch pan. 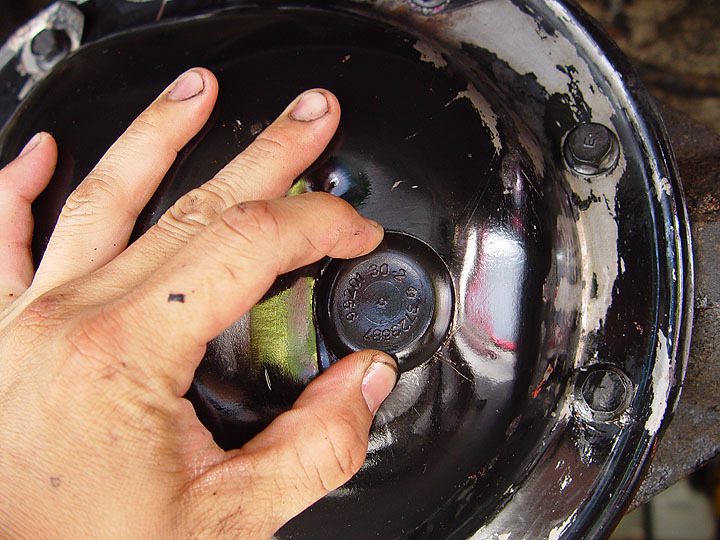 Once drained, remove the remaining bolt holding your differential cover and carefully pry the whole thing off. 6. 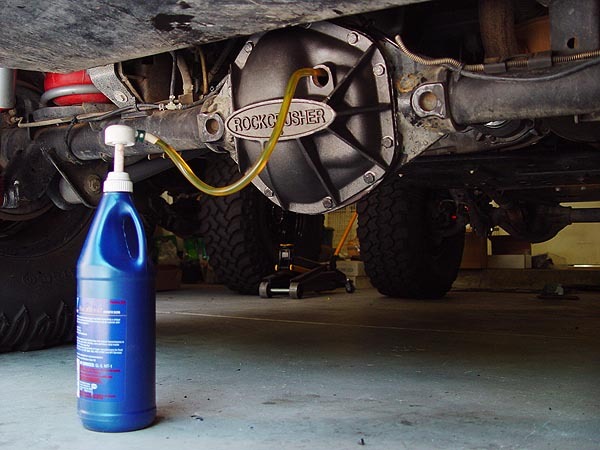 Thoroughly spray the inside of your Jeep's differential with brake cleaners. Use this time to inspect the teeth on the ring, pinion and spider gears or locker if you have one for any damage or abnormal wear. 7. 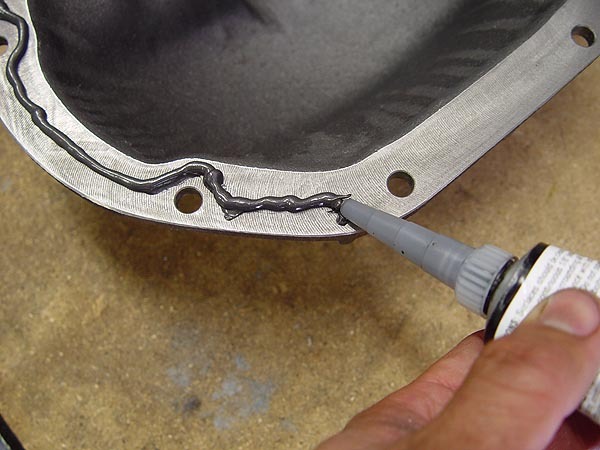 Now, wrap up your differential gears in paper towels the best you can and then begin scraping off the old gasket material using a gastket scaper. Be careful not to scratch or score the mating surfaces. 8. 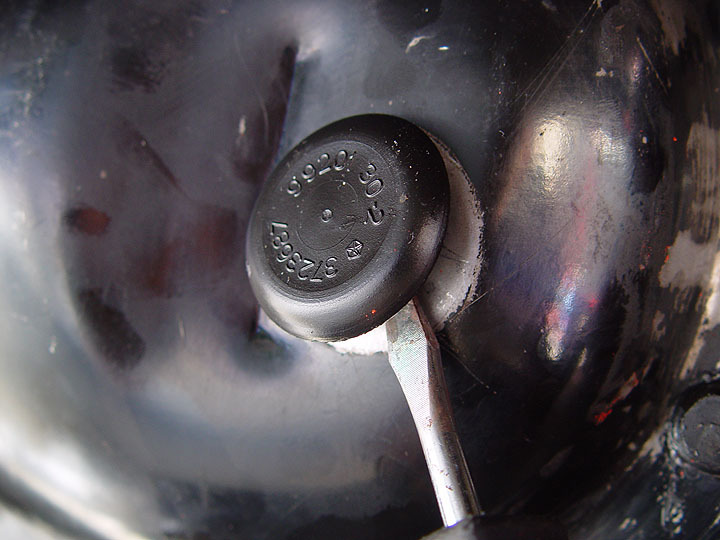 Again, using a gasket scraper, begin scraping off the old gasket material off your Jeep's differential cover being careful not to scratch or score it. Both mating surfaces must be completely clean in order to insure a proper seal. 9. 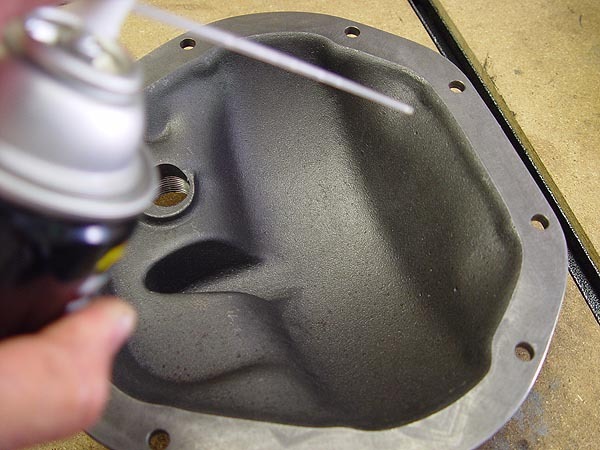 Once cleaned, remove the paper towels out of your Jeep's differential, clean up any gasket debris left behind and then prep the mating surfaces of both it and the cover by spraying them down with brake cleaner. Be sure to ,wipe them down clean with some paper towels. 10. 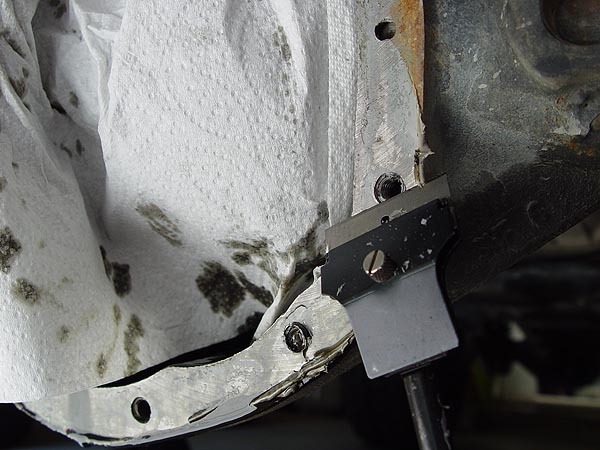 Carfully apply a continuous 1/4" bead of RTV along the entire mating surface of your Jeep's differential cover making sure not to move it around too much. 11. Carefully place the differential cover onto your Jeep's differential housing and fasten the bolts in a criss cross pattern to 30 ft. lbs. of torque. It is very important that you do NOT over torque your bolts and installation of the cover should be done within a 5 minute after applying the RTV. 12a. 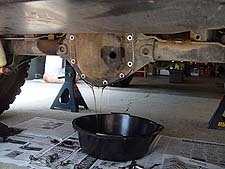 Lower your Jeep back onto the ground and then fill up the differential through the fill hole on the cover with the appropriate gear oil until it begins to ooze out. It should take close to 2 bottles to fill. 12b. 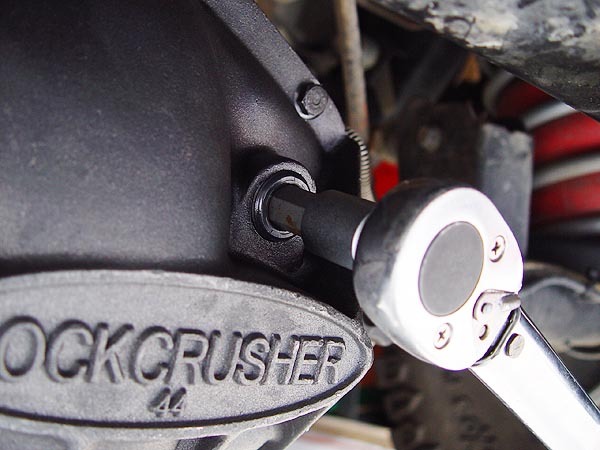 If you currently have or if you've just installed an aftermarket differential cover like a RockCrusher, the fill hole on it will be located much higer up and will be difficult to fill. I would recommend that you pick up a cheap bottle pump from your local auto parts store as it will make this task much easier. NOTE: Just because the fill hole on an after market differential cover is much higher, do not be tempted to overfill your differential as it will cause gear oil to pump out of your Jeep's axle vent tube making a big mess. 13a. On Dana 30 and Dana 44 axles, reinstall the fill plug bolt back onto the differential cover and then tighten it down to 25 ft. lbs. of torque. 13b. On Dana 35 and Chrysler 8.25 axles, simply reinsert the rubber plug back into the fill hole on the differential cover. That should be it for the rear end. Move up to the front of your Jeep and repeat the process. Please let me know if you have any questions and be sure to take your old gear oil to your local auto parts store for recycling.